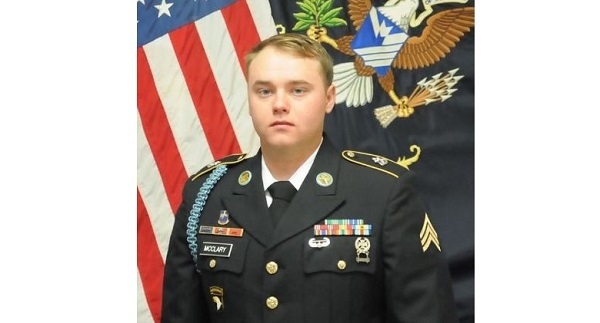 SGT Jason McClary, age 24, died on Sunday, December 2, 2018 in Landstuhl, Germany, as a result of injuries sustained from an improvised explosive device on Tuesday, November 27, 2018, in Andar district, Ghazni province, Afghanistan. McClary was originally from Export, Pennsylvania. He graduated from Kiski Area High School in 2013. While attending school he trained to be a machinist. He joined the Army in January 2014. Prior to his Afghan tour he had served in Iraq from May 2016 to January 2017. SGT Jason McClary was part of a combat movement of Special Forces soldiers traveling on Highway 1 in Ghanzi province. Two U.S. Army Green Berets of the 3rd Special Forces Group died in the incident. An Air Force Special Tactics Airman, SSgt Elchin, attached to the SF operational detachment also died of his wounds in the IED roadside bombing. His military awards include two Purple Hearts, the Army Commendation Medal with Valor, Army Commendation Medal, Army Good Conduct Medal, National Defense Service Medal, Afghanistan Campaign Medal with Campaign Star, Global War on Terrorism Service Medal, Army Service Ribbon, NATO Medal, Iraq Campaign Medal with Campaign Star, Combat Infantry Badge, and Air Assault Badge. SGT Jason McClary passed away at Landstuhl Regional Medical Center in Germany. His wife and two sons were at Landstuhl at the time of his death. “DoD Identifies Army Casualty”, DoD News Release, December 3, 2018.